Summary: While there is significant research behind the NWP model, there is also a need for sites to evaluate their local professional development programming. 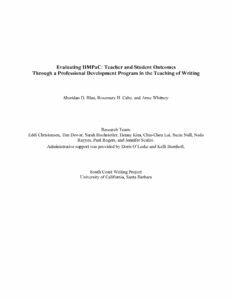 This research study of the South Coast Writing Project’s IIMPaC (Inquiry, Inservice workshops, Models, Practice, and Coaching) program provides an in-depth look at how one site evaluated the program offered as part of a five year partnership with a local district. Teacher consultants and site leaders developing PD that includes any of the core structures of IIMPaC will find the results section useful in planning. The B appendices (p.25-38) on evaluation will be of particular interest to those already offering programming and looking for tools to assist in evaluation. Both program and comparison teachers taught students approaches for planning their writing. However, program teachers’ approach to prewriting activities differed from their counterparts’ in three ways: the range of opportunities for students to develop their own topics, the types of model writing they shared with students, and the range and adaptability of prewriting tools they shared. These practices reflect IIMPaC’s emphasis on writing as a means of communication and on the importance of building students’ capacity to define and develop topics and ideas in planning their writing.